Voice Reader 15 might be described as a “small revolution” in speech synthesis. With just a simple touch of a button, Voice Reader 15 converts any kind of text into astonishingly good quality audio files. Available in up to 45 languages depending on the version. Text-to-speech with naturally sounding voices for private users. Available in up to 67 voices. Professional text-to-speech which can be adjusted to suit your requirements. Create high-quality audio files and publish these royalty free. 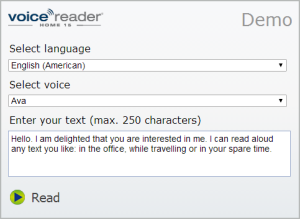 Flexible text-to-speech solution for companys, converts large volumes of text into audio. Contact us, we will be pleased to present you an individual offer! Easy to integrate internet service which converts your websites automatically into audio. The audio samples of Voice Reader 15 are proof of what professional sound-recording software can do. How can you use Text-to-Speech for private or professional purposes. Let yourself be inspired! Find your right Voice Reader 15 product and compare Voice Reader 15 Home, Studio, Server and Web. New findings: The efficiency of Voice Reader was thoroughly tested in a user study by the University of Regensburg. The result was impressive: a 44% increase in efficiency when reading and listening at the same time! Here you can read the user reports of our top customers like Bayerischer Rundfunk and Brockhaus. They speak about their positive experience with Voice Reader Studio and Web as well as Voice Reader Server. There are an infinite number of possible applications for Voice Reader 15 text-to-speech. We have collected some of the most interesting and creative ideas here. 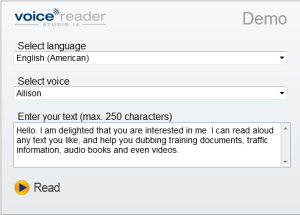 Our customers from the world of business and research are our best reference: Voice Reader is used in versatile ways in large and small companies, public administration and universities. Refer here to our customer list. Your feedback on use of our software products is particularly valuable. Read here the user views of other customers and also take the opportunity to send us your view. We look forward to receiving it! Known from the press, film and TV: Scour our press reviews and read what national and international experts have to say about Voice Reader. Interested in the technological background? Here you will find important information on the basics of speech synthesis and the TTS Technology (TTS = text-to-speech) used in Voice Reader.